Having good skin is essential for your foundation or any makeup product to work seamlessly, not to mention the confidence bonus! Skincare for me is especially important because of the genes I inherited. My dad has oily skin prone to acne, while my mom has very fair, supple, radiant skin prone to freckles. My mom's skin type is normal, and in her case, she can literally pick up any product from the shelf at a drugstore and it would not cause her any problems. The five skin types are: normal, oily, combination, sensitive, and dry. While it is absolutely ridiculous to be so black-and-white in diagnosing your skin type, these categories give you a rough idea of where you stand. In my case, I believe I have mostly combination skin with some sensitivity. This means that if I were to blot my face after a few hours, I could potentially find my T-zone (area around nose and forehead that form a "T") oily. 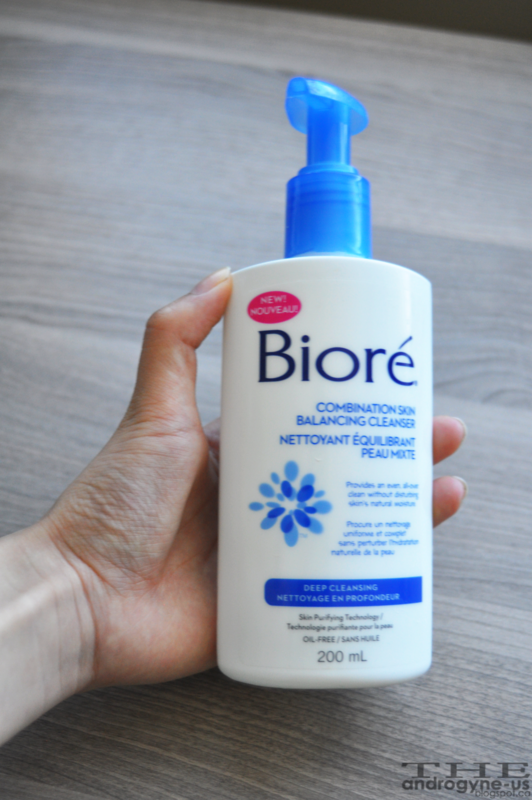 The sensitive part means that harsh ingredients found in most drugstore brands here in Canada could really dry me out, give me a scaly effect around eyes, etc. I don't know about you, but I feel like I have to fight against my genes to achieve "normal" skin. I was sent this cleanser in my June Glossybox. I must say that was probably the box that made me want to stop subscription from Glossybox (I eventually did in July). I felt like I was paying $15 on easily accessible drugstore products that I had no say in. It felt like everyone got the same products no matter how unique their profile might have been. Also, most of the cosmetics came in really unflattering shades, I remember reading a blogger commenting on how they must have the shades that couldn't sell, and I couldn't help but agree! This cleanser and the Wella Ocean Spritz hairspray were the only things worth keeping. 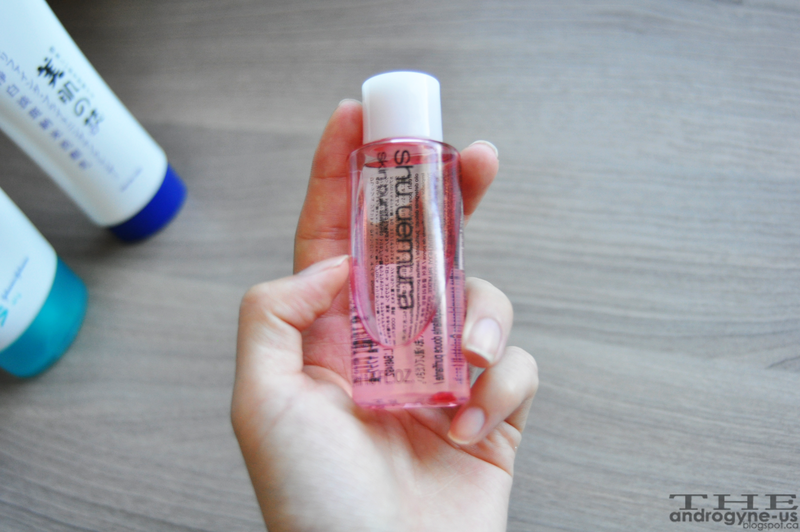 I had some doubts about this cleanser at the beginning (after trying another cleanser from Glossybox- Simple Kind to Skin Refreshing Facial Wash Gel - which felt like it was too gentle), but I was pleasantly surprised. I now use it every morning! First, I rinse my face with a bit of warm water, pump once onto my palm, lather it till it becomes foamy, rub gently all over my face, rinse with some cooler water, and pat dry with a clean cloth. The smell is what morning cleansers should be like, absolutely uplifting. This product doesn't feel stripping to me at all, and if you have combination skin like I do, I highly recommend this. Chances are people that gave bad reviews don't truly have combination skin. :P This cleanser is readily available at your local wal-mart or maybe even shoppers. It comes in a 200mL for around $5-6 CDN, a bargain if you ask me. This is something I leave in the shower shelf when I feel like deep cleansing. A lot of people rave about the St. Ives Apricot Scrub, and I would say it is a much gentler alternative. Actually, having just googled the makeupalley reviews which you can see here, I would sleep better at night if people stopped using it. What you do is apply this in a thin layer all over your face, wait for one minute or so, (I usually leave it on a bit longer so it doesn't feel so abrasive when I wash it off) and gently rinse off. Sometimes I follow up with BeautyMate PURIFYING & BRIGHT Nano Cleanser for double cleansing. As with most exfoliants, please exercise caution and only use this three times a week, max! (I probably only use this once twice a week at most) Any more and you could be doing your face more harm than good. Usually after cleaning so thoroughly, I like to follow up with a face mask. I would recommend this but sadly it's discontinued. "Beauty Mate PURIFYING & BRIGHT Nano Cleanser contains black pearl powder which can provide whitening effect; Morus Nigra Leaf Extract, it minimize dark spot from formulating. Applying nano technology, nano particles purify pores deeply and eliminate dirt and grease and leave a refreshed look." This might be my third or fourth tube of this cleanser. I reckon each tube lasts around 2-3 months. I ordered this through SaSa for around $5.50 USD for 100g of product. This is a white gel-like consistency cleanser, and in the past I've only stuck to cream cleansers because they are what I find to work best for my skin type. Perhaps later I will invest in a Clairisonic, but I will have to do more research that. To use this, you wet your face with lukewarm water, squeeze out a tiny bit, lather in your hands and again, rub gently all over your face, and lastly, rinse off. However my loyalty might have to end at this tube because in the past few months I felt it was a bit harsh and too drying on me. I only use this at night and perahps my skin chemistry changed but for some reason I am not getting along with this like I have before. Perhaps I better go back to cream cleansers.. This is my first cleansing oil, so I'm not sure how I would compare it to any others. However, this is also probably one of the most famous. Mine comes in a 50mL bottle for ~ $13-14 (you can see the comparison to my hand), perfect for traveling and what not. 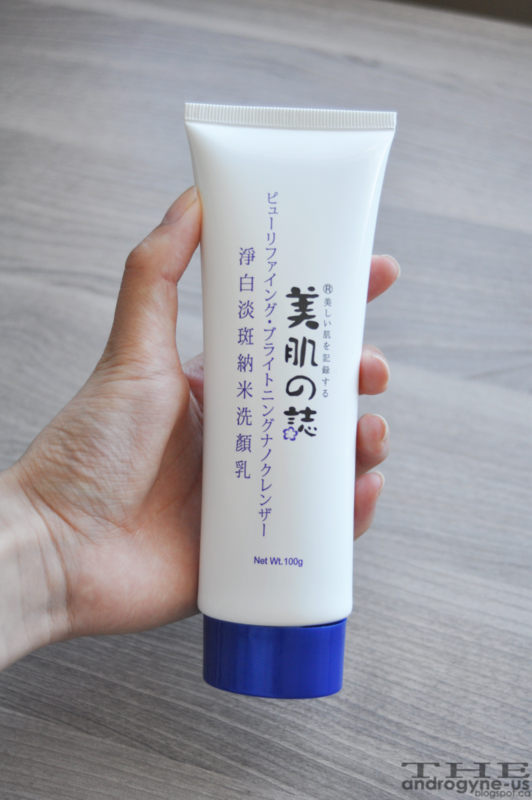 It also comes in 150mL for ~ $30-32 and 450mL for ~ $80. Pretty pricey stuff. As with most things, you can find this on eBay. I do not use this too often, mostly as a last resort, and also because my bb cream usually comes off through double cleansing alone. I have used this as a replacement for my eye makeup remover when I ran out, and I do use this to remove super stubborn mascara though, and it works really well. Now, don't be fooled by the "oil" in this name. To use this, you have to make sure your face is completely dry. Now untwist the cap and you will notice there is a hole (much like the toners where you pour on your palm and pat on your face). This is the same concept, and really, a little goes a long way. Now gently massage your face, eyes (making sure not to get it inside) for around a minute. Now wet your hands with water and massage your face again, you will notice the oil is coming off in a milky white color, this is normal and you simply re-wet your hands and massage again. Repeat a couple times, and then actually wet your face with the water. Everytime I use this cleansing oil, I follow it up with another cleanser just to remove any traces of oil left over. This works really well and I have had this for six months and only used up one-third of the bottle. However, I might not repurchase this simply because it is mineral oil based. A makeup remover I would really want to try right now is Taaj HImalaya Micellar Water, all the reviews make it seem simply divine (but is near impossible to get). 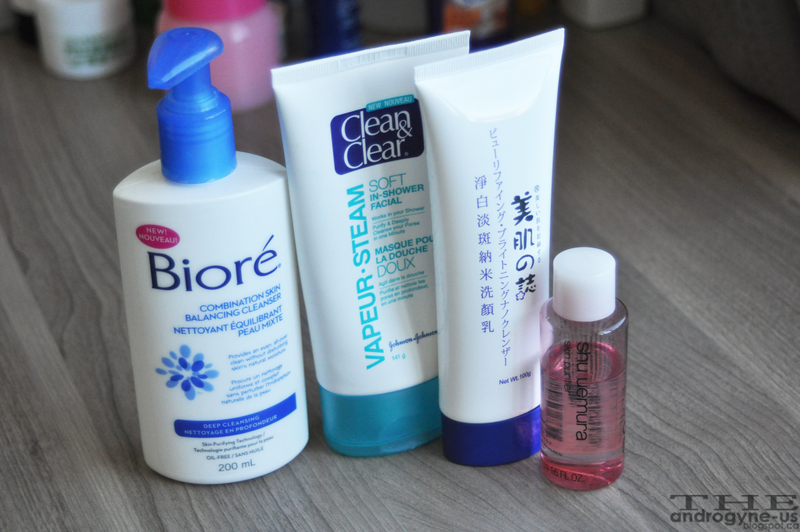 These are all of my current cleansers, and remember what works for me might not work for you. If you think there is a cleanser out there that I'll love, please let me know! What is your skin type? 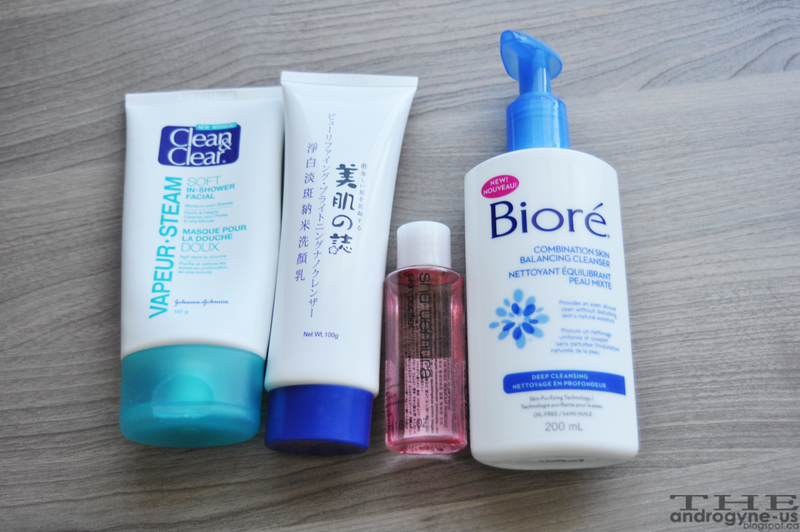 And what are some of your favourite cleansers?